Apartment developers took out fewer building permits in September, stymied by rising interest rates and construction costs. Developers have already been starting construction on fewer new units. During their busiest year in the current cycle, they started construction on 386,000 units in 2015. That fell to 381,000 in 2016 and to 343,000 in 2017. Developers started 2018 with a flurry of new activity, but in recent months they have slowed down again. In September, they started construction on new apartments at a seasonally-adjusted annual rate of just 324,000. Development is gradually becoming more difficult, even though developers and investors are still eager to build new apartments. Interest rates have increased and are forecast to rise further. The 30-day LIBOR has already risen more than a percentage point in the last year, and is also forecast to go up. Lenders have been forced to pass some of that cost on to their borrowers. Banks had already toughened their lending standards earlier in the recovery. They cut back on the size of the loans they are willing to make, relative to the total cost of the project. They have also become more selective about the loans that they make, favoring existing relationships. “The capital is more conservative on its lending practices than in prior cycles (i.e., loan-to-cost ratios, etc. ), but capital is available,” says Rice. The rising cost of development is also making it more difficult to build, Rice notes. Land costs have been increasing throughout the cycle. The best suburban sites are in higher-density areas and these sites are more difficult to obtain due to their prices, as well as rising restrictions in many suburban municipalities. However, strong demand for apartments has helped fill the large number of units that developers have opened so far. Apartment rents continue to grow, on average, faster than inflation. “A combination of financial influences, housing market characteristics and lifestyle preferences make renting the right choice for lots of households,” says Willett. Also, even if developers continue to take out fewer building permits—as they did in September—they have already started construction on many projects. 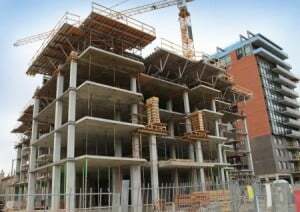 “Multifamily construction activity will remain relatively high for some time yet; a multifamily project started in September 2018 would most likely be completed in 2020,” says Rice.